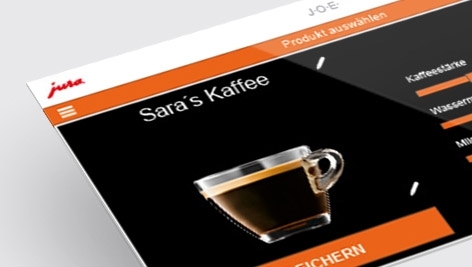 The JURA Operating Experience brings state-of-the-art coffee machine operation to your smartphone. J.O.E.® is the most intuitive, convenient and modern way to make optimum use of all the advantages offered by JURA automatic specialty coffee machines*. 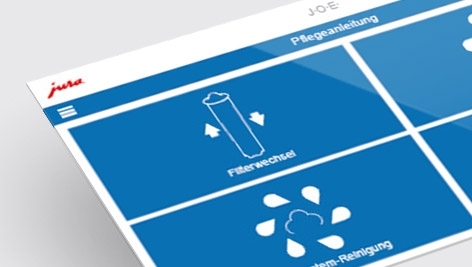 With the JURA Operating Experience you can control your JURA coffee machine* from your smartphone, with all the convenience of touchscreen operation. 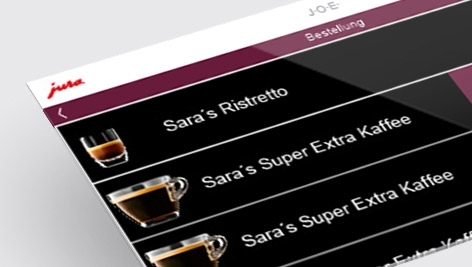 * J.O.E.® is compatible with all JURA coffee machines equipped with the Jura Bluetooth Smart Connect device. The Smart Connect is included with the Jura X8, Z8 and Z6. It is an optional accessory for the following Jura models: WE8, J6, S8, E8, E6 and D6. The J.O.E. smartphone / tablet app can be downloaded from the Apple or Android App Store. Before telling you all of the great things J.O.E. can do, a word on what it can not do: J.O.E. can not turn on your machine and do the initial rinse function. It is not designed to brew a cup of coffee for you from your bed. Its self-explanatory design is sure to make J.O.E.® a very popular option indeed on any smartphone or tablet. 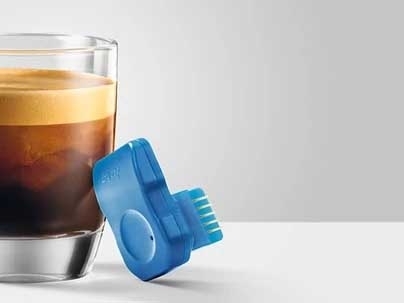 With the simple option of linking J.O.E.® up to your coffee machine via Bluetooth and Smart Connect, this technology is going to make enjoying the perfect cup of coffee just the way you like it even easier. 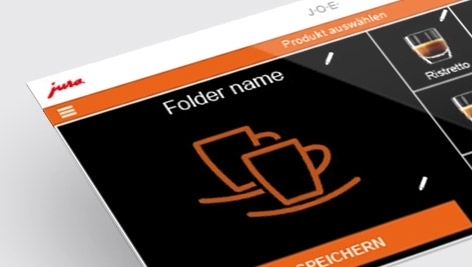 Regardless of whether you opt for plain text or touch display, as a state-of-the-art operating interface, J.O.E.® is revolutionizing how we interact with JURA coffee machines. J.O.E.® can be set to make your favorite coffees exactly the way you like them. You can call your favorite specialty coffees whatever you like and assign an image of your choice. Use the scroll bar to adapt the settings to your personal preferences and enjoy a coffee experience to suit your personal taste. Enter all your guests' coffee choices by simply tapping the symbols and then prepare the specialties. J.O.E. 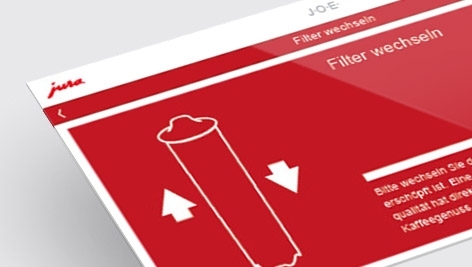 uses pictures and text to guide you through all maintenance programs one step at a time. It's easy to achieve TÜV-certified hygiene with JURA. Indispensable in any professional setting and fascinating to have at home: a clear statistical overview which can be quickly forwarded by e-mail when required for evaluation. 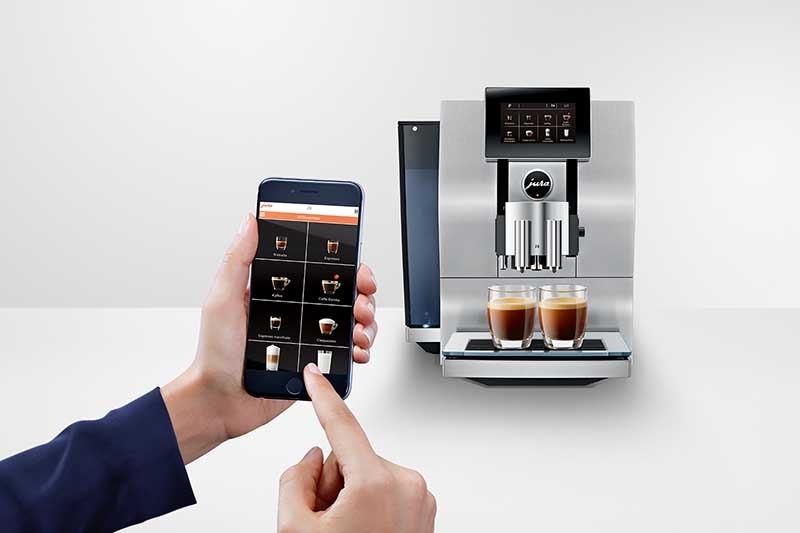 Controlling your automatic coffee machine via your smartphone or tablet is now easier than ever before thanks to JURA Smart Connect, which also enables communication with smart accessories and offers brand new programming options. The new "JURA Smart Connect" uses Bluetooth® communication, based on a transmitter that is simply plugged into the coffee machine. With the app you can then wirelessly operate and program the machine and link up to various accessories. This optional accessory is available directly from Jura.